tick tock why the clock? A lot of people ask us why we call ourselves Clock Tower Music. 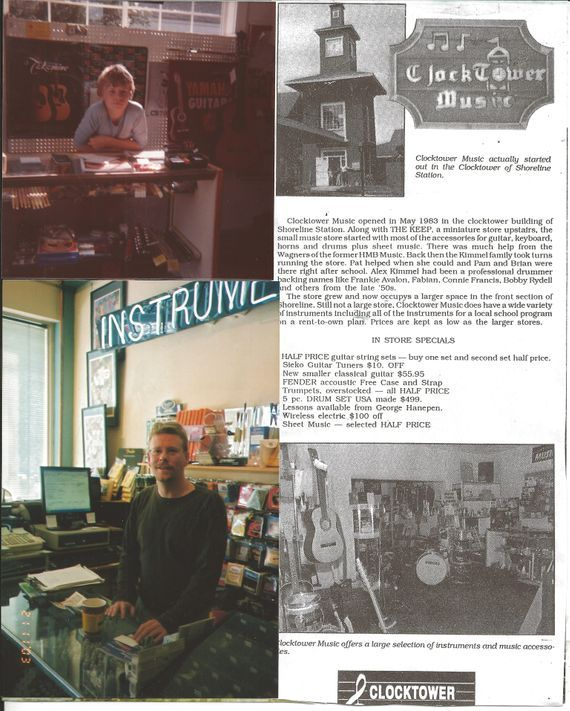 In 1983 Alex Kimmel opened a small music store on the ground floor of a Clocktower building located on Highway 1 in Half Moon Bay. When the business started to grow he moved into a bigger place just around the corner. In 1993 Alex moved his store to San Carlos since Wickersham’s Music had just gone out of business and moved away. When Alex decided to retire in 1995 he offered his son Brian the opportunity to keep the business going. Brian had grown up helping his father since the store opened in 1983 and was hopeful that he could make the business grow even more. Brian bought the business from his father in 1995 and has been running it ever since. R. Alex Kimmel, 76, passed away peacefully at his home in Half Moon Bay on Nov. 7, 2015. He is survived by his wife, Patricia, son Brian, daughter Pamela and grandson David Jr.
Born in Greensburg, Pa., in 1939, to Mary and Edward, he was the youngest of three children. Following in older brother Ed Jr.’s footsteps, he began playing drums at an early age. His passion 66 and settled down in Half Moon Bay. He worked as a Prudential Insurance agent for thirty years. He also opened the local music store at Shoreline Station in 1983. He was very active in the community, joining the Coastside Writers Group and the Sons in Retirement. His passion for music continued through his retirement. He played with several bands including the San Mateo Elks Concert Band, the Senior Friday Night Band and the Half Moon Bay Sit-Down Marching Band. He was loved and will be missed by many.grew and he became a part of many bands. The first group he was in, the Gay Tunes, played backup for Connie Francis, Frankie Avalon, Bobby Rydell, Dion and the Belmonts and Trini Lopez. In 1962 he moved to California to pursue his musical dreams. There he met Patricia, and they married in 1966 and settled down in Half Moon Bay. He worked as a Prudential Insurance agent for thirty years. He also opened the local music store at Shoreline Station in 1983. He was very active in the community joining the Coastside Writer's Group and the Sons in Retirement. His passion for music continued through his retirement. He played with several bands including the San Mateo Elks Concert Band, the Senior Friday Night Band and the Half Moon Bay Sit Down Marching Band.